We are pleased to inform you about the First Footvolley Event on the most beatifull location of the Dutch Island Ameland. In the weekend of Friday 29th of june till sunday the 1st of july you are welcome at Beach Club ‘The Sunset’ in Hollum–Ameland. This tournament is played in 2 days. From saterday till sunday. Poule play on saterday and finals on sunday. Each country is allowed to come with more teams to subsribe on the website www.amelandbeach.nl. This event is open for the less expercienced footvolley players. For this tournament you can subscribe for saterday 29th of july and for sunday 1st of july. So you have 2 tournament days and each day is a seperate tournament. You can find all the information on the website: www.amelandbeach.nl. 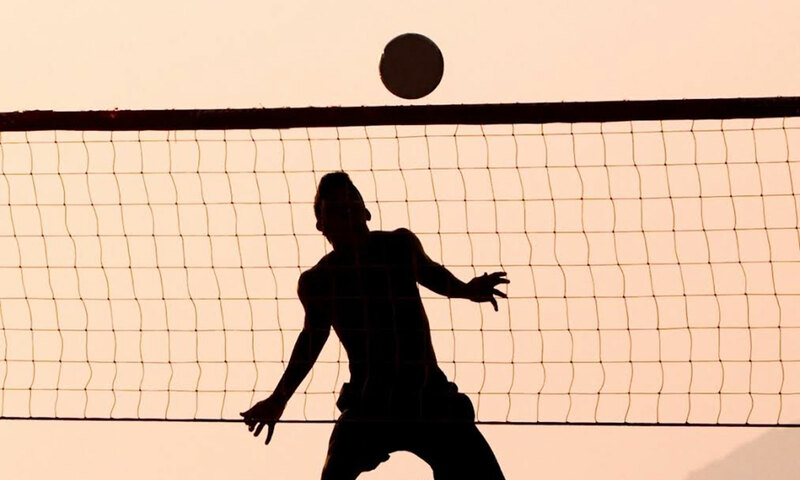 For the International Footvolley event Ameland EC 4 international teams will be invited by the organisation. Costs which will be covered for those 4 teams: Transport on Ameland, hotel from friday 29th till sunday 1st of july, diner on friday and saterday, lunch on saterday and sunday, entrance to the beach party on friday night and saterday night and the fee for the tournament. This tournament is played in 2 days. From saterday till sunday. Poule play on saterday and finals on sunday. We hope to reach a minimum of 16 teams for this level. Enough courts can be arranged. Besides the 4 invited teams the registration fee for the first national teams will be free. The mentioned teams has to inform us and will get a discount code for the website subsription. Each country is allowed to come with more teams. The second or third teams has to subsribe on the website www.amelandbeach.nl. This event is open for the less expercienced footvolley players. For this tournament you can subscribe for saterday 29th of july and for sunday 1st of july. So you have 2 tournament days and each day is a seperate tournament. We highly recommened to subscribe for this level if you are inexperienced. The organisation has te right to subscribe you for this level if we know your level is nog good enough for the Ameland EC Footlvolley . You can find all the information on the website: www.amelandbeach.nl. AWay Event Company in cooperation with Beach Sport Netherlands. Event dates: Saterday 30 June and Sunday 1st of July. (If you stay till Monday, make sure your hotel is booked till Monday). A unique event location in Ameland (one of the islands in the North of the Netherlands). The friendly and supportive people on this Island are pleased to welcome you for the first Footvolley event in Hollum, Ameland. This village counts only 1400 people on the total population of 3500 people of Ameland. All facilities as pubs, restaurants, beach, hotels, golfclub, shops are within a distance of 5 minutes by bike. The event location is situated on te westcoast of Ameland, near the lighthouse of Ameland. •Transport from boat to hotel and hotel to boat. •Hotel Amelander Kaap friday-saterday and saterday-sunday. (extra night for small extra fee). •Breakfast on saterday and sunday. •Lunch on saterday and sunday. •Diner on Friday night and saterday night (bbq). •Entrance fee Friday night party and saterday night party . -Other first national teams are free of charge for the registration fee. -The second and other foreign teams and dutch players will pay the normal price. The registration fee is € 35, for a team, including the entrance fee of 2 beach parties. For the exact information about the options off hotel, diner please check our website: www.amelandbeach.nl. The Ameland open registration fee is for all teams € 35,-. a day. There is no limit of teams in each category. Enough courts can be arranged. At this moment there are still no cash prices. We are still in negotiation to arrange this. But fore sure you want to winn the first Ameland EC Footvolley and it’s trophey. You can find the time schedule on our website www.amelandbeach.nl under programm. We have reserved 9 rooms in Hotel Amelander Kaap till the 1st of May. After that date we can not offer you the rates we have now and we will not be sure the rooms are still free. On our website we also offer a cheap camping arrangement. If you want something else or if you want to come with more friends, family or kids, we can suggest www.boomhiemke.nl. We have no arrangement on the website, but contact us if you want any informaion. You can find the transport information on our website www.amelandbeach.nl under Ameland – OV and Logistics. You have travel by ferry to Ameland. Please check the website www.wpd.nl for exact information. The trip by boat will take 45 minutes. On the Island there is very good transportation to the all locations by bus. The bus will drop you in front of most locations. Based on last year and with the introduction of new sport activities we expact over 300 people attending the sport events and more than 500 for the parties and support. Even when you are not playing by yourself there is enough to do and enjoy the area. Because the event is during the final weekend of the Soccer European Championships we will arrange the possibility to watch the final match on Sunday evening. So if you stay till monday, We’ll go to a pub in or near the village Hollum. If your intrested to come, please sent a mail to Erik Drenth or Arnoud Wildschut directly. We will make sure we’ll answer all questions and support you to come to this Island and make this event a “must go” event the comming years. De laatste ranking van het seizoen is 13 april in Aalsmeer gespeeld. Martijn ten Duis was op 12 april getrouwd en was daarom niet aanwezig. Bart Zantman speelde toch mee en wel met Jordi van der Sluis. Zijn partner, Bas Heijt, was ook niet aanwezig. Het gelegenheidsduo won van Rbii en ten Dam in de finale met 19-17. Rbii en ten Dam hadden Wachtmeester en Drenth uitgeschakeld in de halve finale (18-16). Wachtmeester en Drenth werden derde.